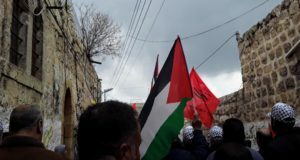 On Sunday June 19th, six International Solidarity Movement activists from the United Kingdom, United States, Brazil, Germany, and Sweden were illegally arrested by the Israeli military after attending a demonstration against the construction on confiscated land belonging to the Palestinian village, Deir Qaddis. Apart from numerous Palestinian, Israeli, and international activists, many children and elderly villagers participated. The demonstrators marched through the village waving flags and chanting slogans. Some of the demonstrators formed a road blockade with rocks on the confiscated land. The Israeli military arrived shortly after and responded with volleys of tear gas, aimed directly at demonstrators. The tear gas canisters set alight the grass around them, causing a fire which spread for hundreds of meters throughout the hills. Then the soldiers forced them to walk in convoy formation. 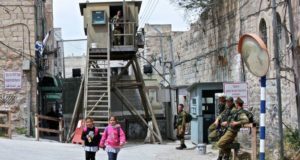 “We walked with a soldier in front of us, behind, and one on either side with guns, shouting at us and using intimidation techniques, forcing us to walk like prisoners,” said one volunteer. She continued to describe her experience as they were taken away from the village. “We walked for approximately 15 minutes in the heat and sun along the road until we were outside the illegal Israeli settlement of Nil’ in. When we repeatedly stated that we did not believe our presence in the village was illegal, or that the arrest was legal, the soldiers responded with the same aggressive responses that we ‘should know the law of the country that we are in, meaning Israel. They then made us get into an armoured jeep, where we were forced to sit in silence before blindfolding us, for the acclaimed reason that we were ‘not allowed to see the settlement’ through which we were passing,” she said. During the first six hours of detention, the activists were kept in an armored military truck, being blindfolded for approximately one hour. After more than ten hours in detention, the activists were forced to stay awake and were given one piece of bread and water. The arresting officer was the Hebrew/English translator during each activist’s interrogation, having testified against them just hours before. He talked over the activists as they gave their testimony, accused the activists of lying and cut one activist off before she could finish her testimony. They were released 17 hours later, after signing a condition stating they will not participate in demonstrations in Deir Qaddis, Bi’lin and Ni’lin. The activists were charged with participating in an illegal demonstration despite the fact that the demonstration took place on Palestinian land and therefore can not be declared illegal under both Israeli and international law.